POINT PLEASANT — A unique parade, of literal Biblical proportions, is gaining support from area churches. 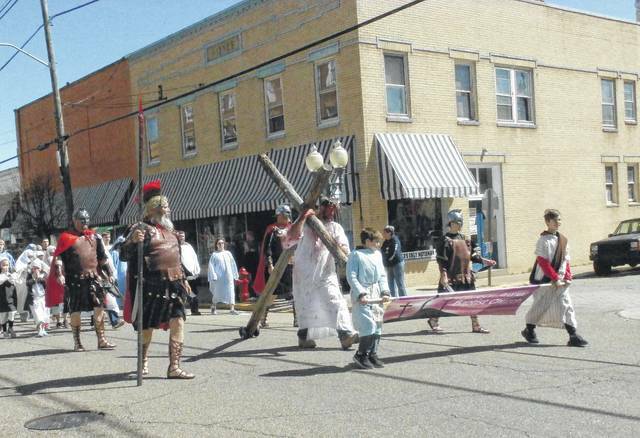 The annual Mason County Easter Parade, depicting the life of Christ from birth to resurrection is set for 11 a.m. on March 24 on Main Street in Point Pleasant. The Mason County Teens for Life are once again hosting the annual Mason County Easter Parade. This is the third year that they are attempting to portray the Easter story in a panoramic way. According to organizers, local churches are coming together to help make this possible by committing to a float that will portray a Biblical scene. Many churches are excited to be participating, according to Denise Bonecutter, one of the organizers. The list of churches that have already confirmed, and their themes, are: Nativity – Leon Methodist, Leon. Wise Men Still Seek Him (The Magi) – Heights U.M. Church, Point Pleasant. John Baptizing Jesus – Pleasant Valley Church, Point Pleasant. I Will Make You Fishers of Men – Trinity U.M. Church, Point Pleasant. Sermon On The Mount – Presbyterian Church, Point Pleasant. The Miracles Of Jesus – LifeSpring Community Church, Point Pleasant. Jesus, The Good Shepherd – Ashton Baptist Church, Ashton. Let the Little Children Come Unto Me – Salem Community Church, West Columbia. Zacchaeus – Mt. Zion Baptist Church, Fraziers Bottom. The Triumphal Entry (Palm Sunday) – First Church of the Nazarene, Point Pleasant. Jesus Drives the Moneychangers out of the Temple – Harvey Chapel Church, Leon. Garden Of Gethsemane – Gospel Lighthouse Community Church, Mt. Alto. Jesus Before Caiaphas – Point of Faith Church, Point Pleasant. Jesus Before Pilate the Governor – Point Pleasant First Church of God, Point Pleasant. Jesus, Mocked, Robed, Crowned – Faith Baptist Church, Mason. Jesus Carrying the Cross – Jackson Avenue Baptist, Point Pleasant, (will be portrayed on the ground not on a float ). Resurrection Praise Float – Fisherman’s Net Ministries Children’s Choir, Point Pleasant. An invitation to participate in the Easter Parade is extended to churches and ministries, also local 4-H groups, sports teams, pageant queens, marching groups, etc. There will be an organizational meeting for all participants Saturday, March 3 at 10 a.m., at the Point of Faith Church (the church is located across from Roosevelt Elementary School). If your church would like to take part please contact Bonecutter at 304-593-6939 or email at missdenise3216@yahoo.com, or Wayne Sanders at 304-812-8132.